:( We are sorry. The page you're trying to view is still under construction. The Open-class inspired Elan 350 has once again consolidated Elan’s reputation as a builder of exciting performance-cruising sailing yachts, where neither performance, nor the cruising capabilites are left to compromise. Its wide transom, twin-rudder arrangement and chined hull deliver excellent control even at high heel angles. Her T-shaped keel ensures a lower centre of gravity and improved righting movement, which in turn reduces displacement. At the end it all adds up to an exhilarating sailing performance, which one expects on much bigger boats. Maybe the best feature yet is how effortless she is to sail, even in challenging conditions. The powerful aft quarters that gives the Elan 350 her power and pace also engenders her with an unrivalled cruising accommodation, with a really spacious aft cabin, generous heads compartment and an aft stowage locker. Her sailing capabilities and comfortable interior will definitely be the envy of many larger cruising yachts. 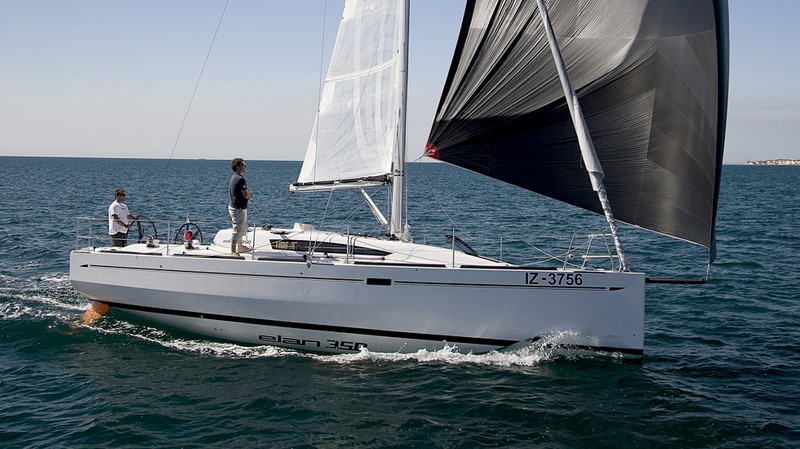 The Elan 350 will definitely put a big grin on every sailing enthusiast’s face. "I would like to receive the latest BYC Yachting Club offers and news."